Ed has over 35 years of extensive experience working on various projects. For over 20 years, Ed was the Director of Design with the Chamorro Design Group and its predecessor, Hallenbeck, Chamorro & Associates, where he was responsible for the design of numerous office, tenant improvements, research and development projects. 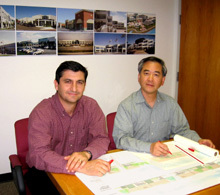 Prior to joining Chamorro Design Group, Ed was a principal at Choi, Misumi & Wong, Architects located in San Francisco. Ed holds a Masters Degree in Architecture from the University of California at Berkeley. He is a registered architect in California and a member of the American Institute of Architects. Ed is a resident of Alameda where he is active in the community. He served on the Harbor Bay Isle Community Architectural Committee and the Bay Isle Pointe Association Project Architectural Committee for twelve years. Sal has over 22 years of comprehensive experience working on various projects ranging from residential, office, to research and development buildings. Prior to formation of our firm, Sal was a project manager for 10 years with Chamorro Design Group where he was responsible for project management, construction documentation, and construction administration for many large scale biotechnology projects. Sal's experience includes work in Los Angeles and Saipan where he was involved in many residential and governmental projects. Sal holds a Bachelor Degree in Architecture from the Instituto Tecnologico de Zacatecas in Mexico.